Portland in-home health care service Housecall Providers says it saved Medicare more than $1.8 million in additional expenses this year. The savings came through the company’s participation in a pilot Independence at Home Demonstration Project. The savings from Housecall Providers outpaced those of 14 other in-home health care firms participating in the pilot program, the Portland company announced. All told, the firms saved more than $10 million in the second year of the program, an average of $1,010 per participating beneficiary, the Centers for Medicare and Medicaid Services said. Housecall Providers achieved a 26 percent savings in patient health costs over a comparison group that did not receive home-based primary care. The Independence at Home project attempts to drive down costs by providing quality in-home care to the nation’s sickest patients. About five percent of the Medicare population require 50 percent of Medicare funding for their complex and expensive care, and many of the patients in this project fall into that category. Providers in the program had to reduce the rate of emergency room visits, hospitalizations and 30-day hospital readmissions among their patients. They also had to follow-up when patients wound up in the ER or the hospital, and had to demonstrate that patients’ wishes were considered in their care. Health care providers who keep their expenditures under a target amount while meeting these quality measures are eligible for bonus payments. For meeting those six quality measures in its treatment of 249 patients, Housecall Providers will receive approximately $1.1 million as its share of the savings to Medicare. “I’m going to push harder than ever to make sure older Americans across the country can continue to receive this kind of care in the comfort of their home,” said Wyden, who along with Sen Edward Markey, D-Mass, authored the provision in the Affordable Care Act that created the Independence at Home project. Have two or more chronic conditions. Have coverage from original, fee-for-service (FFS) Medicare. Need assistance with two or more functional dependencies (e.g., walking or feeding). Have had a non-elective hospital admission within the last 12 months. Have received acute or subacute rehabilitation services in the last 12 months. Dennis Thompson is a contributing health care reporter based in Salem. Chicago, IL (August 10, 2016): The American Academy of Home Care Medicine (AAHCM) is pleased that Centers for Medicare and Medicaid Services (CMS) has announced the exceptionally good news: The Independence at Home (IAH) Medicare Demonstration practices continued to improve care and lower costs in Year 2 of its second performance year. IAH, an AAHCM legislative initiative, provides home based primary care to elders with severe chronic illness and disability. The interdisciplinary teams provide better clinical care and patient experience, while also reducing total Medicare costs. CMS reported that IAH practices saved over $10 million during the second performance year – an average of $1,010 per participating beneficiary – while delivering high quality care in the home. According to CMS analysis, all 15 practices, which served more than 10,000 Medicare beneficiaries, improved quality from the first performance year in at least two of the six quality measures for the Demonstration. Less use of inpatient hospital and emergency department services for conditions such as diabetes, high blood pressure, asthma, pneumonia, or urinary tract infection. While 7 of 15 IAH practices achieved savings, every IAH practice contributed to the success of the IAH Demonstration, and all believe they will show continued high quality results when the Year 3 results are released. AAHCM congratulates all of the practices for their hard work in this Demonstration. With the introduction of the Independence at Home Act (S.3130) in July, 2016, AAHCM and the many supporting organizations are advocating for conversion of Independence At Home into a national Medicare program. The American Academy of Home Care Medicine is the leading national professional organization for those providing home care medicine services. For further information about the Academy, see www.aahcm.org. AAHCM is a professional organization serving the needs of thousands of physicians and related professionals and agencies interested in improving care of patients in the home. AAHCM delivers on the promise of interdisciplinary, high value health care in the home for all people in need by promoting the art, science and practice of home care medicine. The AAHCM membership is comprised of physicians, medical directors, nurse practitioners, physician’s assistants, registered nurses, social workers, practice administrators, and residents/students working in the field of home care medicine. Chicago (July 6, 2016): The American Academy of Home Care Medicine (AAHCM) applauds the introduction of Independence at Home (IAH) Act that would convert the highly successful IAH demonstration project to a nationwide program. This bipartisan legislation, introduced by Senators Ed Markey (MA), John Cornyn (TX), Michael Bennet (CO), and Rob Portman (OH), would extend service of home-based primary care services to all chronically ill and disabled elders who need it. AAHCM is a leading advocate for the IAH model, which involves mobile teams that provide coordinated primary care and social services in the home for elders with severe chronic illness and disability. The IAH team model has rigorous quality measures, provides a better patient and family experience by enhancing dignity and independence at home, and reduces total Medicare costs. IAH has shown that home-based primary care substantially reduces overall Medicare costs. CMS collects the first 5% of savings and distributes further savings to programs that meet major quality measures and save more than 5%. IAH saved $25M in Year 1 with $13M accruing to CMS and $12M to the IAH providers. AAHCM is a professional organization representing physicians and related professionals and agencies committed to improving care of patients in the home. AAHCM delivers on the promise of interdisciplinary, high value health care in the home for all people in need by promoting the art, science and practice of home care medicine. Washington (July 6, 2016) – Senator Edward J. Markey (D-Mass. ), John Cornyn (R-Texas), Michael Bennet (D-Colo.) and Rob Portman (R-Ohio) today introduced legislation to convert the Independence at Home (IAH) demonstration into a permanent, national Medicare program. Independence at Home is an innovative, team-based model that is bringing measurable, highquality care to patients suffering from multiple debilitating diseases such as Alzheimer’s, ALS, congestive heart failure, diabetes and Parkinson’s, while significantly lowering costs for the Medicare program. In 2012, Independence at Home began as a three-year demonstration program. Last year, the House and Senate approved a two-year extension. The Senate Finance Committee’s Chronic Care Working Group is currently considering making IAH nationwide in scope. Senators Markey and Ron Wyden (D-Ore.) are the original co-authors of the Independence at Home provision in the Affordable Care Act. More information about the Independence at Home program and CMS’s program evaluation can he found HERE. Jerald Winakur’s Feb. 14 Sunday Opinion commentary, “Doctoring is a dying art,” was right to say that in today’s corporatized, professionally fragmented medical landscape it is almost impossible for a primary-care doctor to take the time to truly connect with patients and their families. I am blessed, however, to work in a setting that allows just that: the Veterans Health Administration. As medical director of the Home Based Primary Care program at the Martinsburg (W.Va.) Medical Center, I oversee teams that provide care to frail patients in their homes. I have the time to hear their stories, know their family caretakers, perform a good physical exam and do a thorough chart review. Our typical patient is elderly and has multiple medical problems, which adds to the complexity of care. Our electronic records system allows me to access patients’ prior medical records at any VA facility. Such programs decrease hospitalizations and the length of stay for chronically ill patients, cutting the costs of inpatient care. Medicare recently began testing a similar initiative, the Independence at Home program, which, in the first year of a three-year pilot study, generated savings of $25 million. Home-based primary-care programs can be a refuge where doctors, and their nurse-practitioner and physician-assistant colleagues, can practice traditional personalized medicine while enjoying the benefits of modern communications technology. Milton D. Havron Jr., Winchester, Va. In successfully reducing healthcare expenditures, patient goals must be met and savings differentiated from cost shifting. Although the Department of Veterans Affairs (VA) Home Based Primary Care (HBPC) program for chronically ill individuals has resulted in cost reduction for the VA, it is unknown whether cost reduction results from restricting services or shifting costs to Medicare and whether HBPC meets patient goals. Cost projection using a hierarchical condition category (HCC) model adapted to the VA was used to determine VA plus Medicare projected costs for 9,425 newly enrolled HBPC recipients. Projected annual costs were compared with observed annualized costs before and during HBPC. To assess patient perspectives of care, 31 veterans and caregivers were interviewed from three representative programs. During HBPC, Medicare costs were 10.8% lower than projected, VA plus Medicare costs were 11.7% lower than projected, and combined hospitalizations were 25.5% lower than during the period without HBPC. Patients reported high satisfaction with HBPC team access, education, and continuity of care, which they felt contributed to fewer exacerbations, emergency visits, and hospitalizations. HBPC improves access while reducing hospitalizations and total cost. Medicare is currently testing the HBPC approach through the Independence at Home demonstration. J Am Geriatr Soc 62:1954–1961, 2014. The U.S. currently faces serious challenges to improving population health, improving the care experience, and reducing total care cost.1,2 Escalating healthcare expenditures, driven by an aging population and rising care costs, have prompted efforts to restrict access or payment.3,4 The fastest-growing sector of the U.S. population, individuals aged 85 and older, grew 30% between 2000 and 2010;5 in this same period, the comparable veteran population nearly tripled. In the general aging population, expenditure growth is concentrated in a small fraction of individuals, with 5% of Medicare recipients generating 50% of Medicare expenditures.2,6 In the Department of Veterans Affairs (VA), 2% of veterans account for 36% of VA healthcare costs, and 7% account for half of VA costs. The Congressional Budget Office (CBO) reported that, although Medicare costs rose 29% per recipient from 1998 to 2005 (4.4% per year), VA costs rose only 1.7% per person over those 7 years (0.3% per year). The CBO suggested that one important element of the VA’s cost containment was growth of programs such as Home Based Primary Care (HBPC), specifically designed for the highestcost sector: individuals with serious chronic disabling diseases, many of whom are homebound. Home Based Primary Care is comprehensive longitudinal primary care delivered in home by an interdisciplinary team, including a physician, nurse, social worker, rehabilitation therapist (occupational therapist, physical therapist, kinesiotherapist), dietitian, psychologist, and pharmacist. In addition to these required disciplines, many programs include a midlevel provider (nurse practitioner, physician assistant) and other providers such as chaplains and recreational therapists. VA HBPC specifically focuses on individuals with complex, chronic, disabling disease, for whom routine clinic-based care is often not effective,8 and is different from and complementary to usual Medicare home care. HBPC targets multiple serious chronic conditions rather than short-term remediable conditions, is comprehensive rather than focused on individual problems, provides longitudinal rather than episodic care, and is interdisciplinary rather than discipline specific. HBPC factors that contribute to success include a single unified care plan, medication reconciliation, caregiver training, and attending to people at home, which facilitates comprehensive understanding of medical and social circumstances. Home Based Primary Care is a major component of the VA’s strategy to shift care from institutional to home and community settings, which is often more patient-centered and potentially lower cost. Between 2000 and 2012, the number of veterans aged 85 and older tripled, and the HBPC census increased from 7,300 to 30,000, whereas the VA-provided nursing home care census rose only 20%, from 30,700 to 36,000. On the VA’s 2007 National Patient Satisfaction Survey, 83% of veterans rated HBPC care as very good or excellent, the highest overall satisfaction rating of all VA care programs. In a 2002 longitudinal pre– post analysis of 11,334 individuals, HBPC enrollment was associated with a 24% total VA cost reduction (P < .001).8 In a similar 2007 analysis, HBPC enrollment was associated with reductions in VA hospital bed-days of care (59%), nursing home bed-days of care (89%), and 30-day hospital readmissions (21%).8 Despite these promising findings, there are limitations of pre–post analyses, and the effect on total cost remains uncertain. Robust methods of analysis are needed in addition to randomized controlled trials to meet the challenges of evaluating complex interventions involving diverse populations with variable comorbidities receiving individualized care in a rapidly evolving healthcare system. Another methodology to project population cost that the Centers for Medicare and Medicaid Services (CMS) uses is the hierarchical condition category (HCC) model, a validated risk adjustment method9,10 widely used in computing expected costs in shared savings programs and CMS demonstrations. By using an individual, risk-adjusted projection, bias in pre–post analyses from regression to the mean effects can be avoided. Using the HCC model, this study undertook to determine whether HBPC reduces federal government (VA plus Medicare) (VA+MC) healthcare utilization and costs without restricting services or shifting costs from the VA to Medicare. To address concerns about natural cost variation, total cost of care during HBPC was compared with projected cost for the same population. To address quality of experience and perceptions of potential restrictions of services, the veteran and family perspective was examined using a qualitative evaluation. To determine the effect of HBPC on VA+MC costs and to distinguish cost savings from cost shifting, concurrent analyses of VA and Medicare costs and usage for fiscal year (FY) 2006 (10/1/05–09/30/06) were performed. For veterans newly enrolled in HBPC, matching Medicare and VA enrollment files identified the subset dually enrolled in VA and Medicare. VA costs for all directly provided or purchased care, including inpatient, outpatient, long-term services and supports (LTSS), and pharmacy for 6 months during HBPC enrollment were obtained from the VA 2005–07 Decision Support System National Data Extract. Concurrent Medicare Part A and B person-level costs were computed by aggregating claims-level costs from Medicare fee-for-service Standard Analytical Files (inpatient, outpatient, skilled nursing, home health, hospice, physician/suppliers and durable medical equipment). Medicare data were obtained from CMS under a data use agreement between VA and CMS. VA and Medicare costs were combined to create a merged total VA+MC actual cost file. The cost-projection methodology using concurrent HCC scores, which use coded diagnoses, interaction of multiple comorbidities, and demographic factors, but not prior utilization, to yield projected cost, was adapted to the VA and then tested for calibration. Cost-projection models are prospective or concurrent, which reflects the relationship between diagnostic codes and other factors used to project cost and the occurrence of costs. Prospective models use diagnoses from 1 year to project costs for a future period. Concurrent models use the diagnoses from 1 year to project costs for that year. Concurrent models explain more of the variation in costs (with correlation coefficients (r2 ) of 0.48–0.58 vs 0.09–0.12 for prospective models) and are useful for evaluation of past behavior. Concurrent models emphasize acute conditions over chronic conditions more than prospective models. These acute exacerbations of chronic conditions are more likely than stable chronic conditions to drive the cost experience after enrollment in HBPC in what is frequently a period of posthospital clinical instability. Calibration. Concurrent coefficients for the CMS HCC model most appropriate to a geriatric population (version 21) were estimated using total VA+MC actual costs, and the concurrent VA-HCC model was used to project annual costs for the HBPC population.11,12 To test calibration and validity, the 6.6 million non-HBPC veterans were divided into deciles according to projected total cost, comparing projected costs with actual VA+MC costs using the new VA-HCC model. To assess validity in the highest-cost group, the top 10% cost decile was broken into 1% cohorts, and projected and actual costs were compared. Model Residual Cost Variable. The VA provides a broader array of services than fee-for-service Medicare JAGS OCTOBER 2014–VOL. 62, NO. 10 IMPROVED ACCESS, QUALITY, AND COST 1955 to treat a homebound frail population, including noninstitutional LTSS such as homemaker or home health aide, adult day health care, and respite. Eligibility for these geriatric and extended care (GEC)-administered noninstitutional and institutional supports requires significant impairments in cognition and activities of daily living (ADLs), equivalent to Nursing Facility Clinically Eligible (NFCE) status in state Medicaid programs. The CMS-HCC model does not include those long-term care costs. To account for costs of services that Medicare does not cover and for HBPC population frailty,8 a VA GEC programmatic variable was included while recalibrating the model, based on veterans receiving VA-purchased or -provided noninstitutional care services. The programmatic variable, with a value of 1.98, functions similarly to the Medicaid demographic variable plus frailty adjustment in the CMS-HCC model when applied to Program of All-Inclusive Care for the Elderly participants, accounting for the cost residual from the HCC model when applied to a frail, clinically complex population.13 This recalibrated VA-HCC model was validated by comparing projected with actual costs of each decile of the 6.6 million veterans and the top 10 cohorts. Cost Projection. After validation of the adapted model with 6.6 million veterans, the VA-HCC model was used to project VA+MC costs for 9,425 veterans newly enrolled in VA HBPC during 2006. These veterans were divided into deciles according to VA-HCC score; projected VA+MC cost was compared with actual VA+MC cost. Cost Category Effects. The HCC model has demonstrated utility for projecting total costs but does not provide information on service use or categorical costs. Therefore, a different method was used to examine patterns of healthcare use (e.g., acute hospital days, skilled nursing facility days) and cost according to healthcare category (e.g., acute inpatient, outpatient, home care), before and during HBPC. For the 9,425 veterans enrolled in HBPC during FY2006, VA+MC use and costs that each veteran in the 6 months incurred before HBPC enrollment were compiled from the previously merged files. These were compared with VA+MC use and costs during the subsequent 12 months while in HBPC, normalized to 6 months of program exposure. This method provided estimated proportionate distribution of use and costs and allowed comparison of HCC cost projection with longitudinal case–control cost analysis. Qualitative Approach. Veterans and caregivers were interviewed about HBPC perceptions at the Memphis, Tennessee; Sacramento, California; and Tucson, Arizona HBPCs, representing geographic variation and established programs. A purposive sampling strategy14 identified veterans with family caregivers with recent (6–12 months) and longer (≥2 years) HBPC experience. In-home interviews used a semistructured interview guide focusing on services received, HBPC experience, transition to HBPC, and changes in health or quality of life during HBPC. Interviews were audiotaped, transcribed, coded, and analyzed.15–17 The coding interrater reliability kappa statistic18 was 0.822. The 9,425 HBPC veterans were predominantly male (96%) and older (77.7  10.0), with 69% dependent in two or more ADLs; 50% were married, and 32% of spouses were limited in ADLs. HBPC veterans had, on average, more than eight physical and mental health conditions, median survival of 38 months, 1-year survival of 76%, and 5-year survival of 33%. The 6,951 HBPC veterans enrolled in Medicare were older than the 2,474 HBPC veterans not enrolled in Medicare (78.4  9.8 vs 70.8  13) and had lower 1-year survival (72.7% vs 81.9%). The HBPC Medicare veterans had higher average CMS-HCC (3.31 vs 2.22) and VA-HCC (5.29 vs 4.21) scores than the HBPC non-Medicare veterans. Mean observed/projected cost ratios were similar: 1.005 ($48,894/$48,642) for VA+MC veterans and 1.053 ($40,807/$39,645) for VA-only veterans. The qualitative sample of veterans mirrored the national HBPC population in demographic characteristics and medical complexity. Of 17 veterans interviewed, 14 had family caregivers who were interviewed; 64% of those caregivers had their own medical problems. Using CMS-HCC scores to subdivide the population into deciles, then into 10 cohorts for the top decile, observed and projected cost comparisons demonstrated a close match for all deciles and the highest-cost cohorts (Figure 1A, B). VA-HCC scores (adjusted for non-MC costs and frailty) demonstrated the same degree of calibration. Figure 1C shows the 10th decile of VA-HCC scores, most relevant for HBPC veterans. Applying the programmatic variable of 1.98 to the combined VA+MC per capita cost of $9,152/HCC unit, cost attributed to this programmatic variable was $18,121. Overall VA-HCC model r2 was 0.53, consistent with a CMS-estimated concurrent model r2 of 0.56. For the 6,951 HBPC and Medicare dually enrolled veterans, HBPC enrollment was associated with a 13.4% annualized reduction in total combined VA+MC costs (not adjusted for frailty or VA care differences), 16.7% reduction in VA costs, and 10.8% reduction in Medicare costs, driven primarily by less hospitalization. There was a 25.5% reduction in combined VA+MC hospital admissions and 36.5% reduction in combined hospital days, contributing to a combined VA+MC cost net reduction from $45,980 to $39,796 per patient per year including HBPC costs ($9,116/patient per year) (Table 1). Without HBPC, mean VA+MC annual costs projected by risk-adjusted HCC ($45,061  3,478) were nearly identical to observed costs ($45,980  34,383). The observed annualized cost during HBPC was $39,796  33,472, 11.7% lower than projected cost (t = 17.47, P < .001). When organized according to VA-HCC risk deciles, annualized costs during HBPC were less than projected for all deciles (Figure 2). Comparing projected with actual HBPC cost, cost reductions were greater at higher risk levels. Estimated VA costs according to spending categories are shown in Table 2 using 6-month longitudinal case– control comparison. They demonstrate the same pattern found in the 2002 study,8 with large reductions in nursing home and hospital costs, slightly higher total outpatient costs (including pharmacy), and larger homecare costs, which include HBPC cost. Veterans, on average, had 2.9 HBPC visits per month. Home visits allowed staff to establish trusting relationships with veterans and caregivers (Table 3). While providing care, staff gathered information about veterans’ and caregivers’ health, emotional state, needs, informal supports, concerns, and goals. Coordination between interdisciplinary team members resulted in a comprehensive clinical picture that improved care because staff could create and implement personalized care plans. No veterans or caregivers reported any perception of restriction of services from HBPC. Instead, many described how HBPC prevented avoidable hospitalizations, allowed them to continue living at home, and often meant the difference between receiving and not receiving care. Veterans spoke about frustration with clinic-based provider changes and clinic access difficulties because of their condition, distance, travel costs, and transportation challenges. Participants valued the ability to call their HBPC team with concerns, which relieved anxiety and offered an alternative to emergency department visits. Veterans and caregivers learned strategies for self-care and caregiving and how to identify and respond to disease exacerbation. Nurses filled medication boxes for 88% of veterans, who reported that the team reviewing medications for effectiveness, side effects, or drug interactions ensured that the right medications were taken at the right time in the right dose. This mixed-methods analysis demonstrated two complementary findings: VA HBPC reduced total costs of care to VA and Medicare, eliminating cost-shifting to Medicare as an explanation for reduced costs, and veterans and their family caregivers reported greater access to care, stronger relationships with staff, better quality of care, and enhanced quality of life, indicating that savings were achieved by adding, not restricting, services. Veterans trusted this type of care, attributing the prevention of avoidable and unwanted hospital and emergency care to HBPC. Staff, veterans, and caregivers reported characteristics of HBPC that have been shown to correlate with fewer hospital readmissions of Medicare beneficiaries,21 such as better adherence to medication management, individual involvement in healthcare decisions, early recognition of exacerbation of symptoms, and family caregiver support. The qualitative approach confirmed a lack of perceived restrictions in services, which is crucial in evaluating an intervention that reduces costs. The results of the current study differ from those of a randomized trial of HBPC,22 which found a similarly significant improvement in individual and caregiver quality of life but no difference in total costs (after accounting for cost of HBPC), but in that trial, the mean time on HBPC was 4.5 months. Thus, half of the evaluation period was without intervention, more reflective of episodic home health services than longitudinal HBPC. Only 78% of individuals in the HBPC arm received HBPC, and 9% of the non-HBPC arm received HBPC. The populations were also different; mortality was 36%, compared with 24% in the current study and 17% to 24% in other HBPC studies showing cost reduction. The current study has several limitations. Longitudinal case–control comparison is subject to regression to the mean, but this was used only for descriptive comparison of service use, not cost. The HCC projection con- firmed the “expected” cost of the veterans without intervention and provided a benchmark not subject to such regression to the mean. An additional programmatic variable was used to account for selection biases and for VA services not accounted for in Medicare. There are limitations to the use of this variable, including incorporating average cost experience for GEC noninstitutional care program–referred veterans that may not be reflective of veterans who are similar to those enrolled in HBPC. The absence of functional status measures for veterans other than those in HBPC or in nursing facilities limits the ability to attribute GEC program costs more specifically to particular individuals and impedes fully adjusting for cost of LTSS that VA covers but Medicare does not. Data come from 2006, the most recent year of Medicare data available when the analysis was conducted in 2009 to strengthen support for the Independence at Home demonstration being part of the 2010 Affordable Care Act.24 Well-calibrated cost-projection models can have great value in evaluating innovative programs for frail elderly adults, but as with all prediction models, they must be calibrated when applied to new populations. To allow a comparison of costs during the program with costs incurred without HBPC enrollment, only new enrollees to HBPC were analyzed, so effects may not be generalizable to subsequent years in HBPC. Because projected costs without HBPC were compared with observed HBPC costs during the same year, there was variable time spent in HBPC, from which costs were annualized. Possible cost savings and cost shifting to Medicaid and private pay with HBPC care were not examined. Current work at the VA GEC Data Analysis Center, using an all-payer data set, prospective cost-projection with adjustments for increased mortality, LTSS, and time-dependent frailty, will address these limitations. The qualitative sample size was small. Because the objective of qualitative research is to understand phenomena in depth (as opposed to broadly), qualitative sample sizes are traditionally small.25 Participant selection was representative of the HBPC population, increasing confi- dence that the data validly represent HBPC experiences, but ethnographic data were collected at three sites, which may not fully encompass the range of individuals and experiences in 133 HBPC programs and 30,000 veterans served in 2006. We wish to thank Michael Cagan, Director of the Medicare and Medicaid Data Analysis Center, and Steven Kendall, Director of the Allocation Resource Center, for their assistance in providing access to the cost data used for this analysis. Presented at the American Geriatrics Society Annual Meeting, Orlando, Florida, May 2010. Conflict of Interest: Dr. Kinosian is an HBPC provider; Dr. Edes has national responsibility for HBPC. Dr. Edes has testified before Congress and MedPAC on the effectiveness of HBPC. This study was supported by Geriatrics and Extended Care, Office of Clinical Operations and Management, Veterans Health Administration, VA; Intel Corporation; and the Memphis VA Medical Center. Author Contributions: Edes: concept, design, data acquisition, analysis, interpretation, preparation of paper. Kinosian: concept, design, data acquisition, analysis of quantitative portion, interpretation, preparation of paper. Vuckovic, Nichols: concept, design, data acquisition, analysis of qualitative portion, preparation of paper. Becker: concept, analysis, preparation of paper. Hossain: design, data acquisition, analysis of quantitative portion, and preparation of paper. REFERENCES 1. Berwick DM, Nolan TW, Whittington J. The triple aim: Care, health, and cost. Health Aff (Millwood) 2008;27:759–769. 2. Blumenthal D. Performance improvement in health care: Seizing the moment. N Engl J Med 2012;366:1953–1955. 3. Hartman M, Martin AB, Benson J, the National Health Expenditure Accounts Team. National health spending in 2011: Overall growth remains low, but some payers and services show signs of acceleration. Health Aff (Millwood) 2013;32:187–199. 4. The Path to Prosperity: A Blueprint for American Renewal: Fiscal Year 2013 Budget Resolution. Washington, DC: House Budget Committee, 2013 [on-line]. Available at http://budget.house.gov/uploadedfiles/pathtoprosperity 2013.pdf Accessed October 10, 2012. 5. Census Bureau. Census Shows 65 and Older Population Growing Faster than Total U.S. Population. CB11-CN.192. Washington, DC: U.S. Census Bureau, 2010 [on-line]. Available at http://www.census.gov/newsroom/ releases/archives/2010_census/cb11-cn192.html Accessed June 13, 2013. 6. Stanton MW, Rutherford MK. The High Concentration of U.S. Health Care Expenditures. Research in Action Issue 19. AHRQ Publication No. 06–0060. Rockville, MD: Agency for Healthcare Research and Quality, 2005. 1960 EDES ET AL. OCTOBER 2014–VOL. 62, NO. 10 JAGS 7. Percy A. The Health Care System for Veterans: An Interim Report. The Congress of the United States Congressional Budget Office, Publication No. 41656, December 2007 [on-line]. Available at http://www.cbo.gov/ sites/default/files/cbofiles/ftpdocs/88xx/doc8892/12–21-va_healthcare.pdf Accessed May 16, 2013. 8. Beales JL, Edes TE. Veteran’s Affairs home based primary care. Clin Geriatr Med 2009;25:149–154. 9. Pope GC, Kauter J, Ellis RP et al. Risk adjustment of Medicare capitation payments using the CMS-HCC model. Health Care Financ Rev 2004;25:119–141. 10. Pope GC, Kauter J, Ingber MJ et al. Evaluation of the CMS-HCC Risk Adjustment Model Final Report. RTI International, 2011 [on-line]. Available at https://www.cms.gov/Medicare/Health-Plans/MedicareAdvtgSpe cRateStats/downloads/Evaluation_Risk_Adj_Model_2011.pdf Accessed August 1, 2013. 11. Kautter J, Pope GC, Trisolini M et al. Medicare physician group practice demonstration design: Quality and efficiency pay-for-performance. Health Care Financ Rev 2007;29:15–29. 12. Colla CH, Wennberg DE, Meara E et al. Spending differences associated with the Medicare physician group practice demonstration. JAMA 2012;308:1015–1023. 13. Kauter J, Ingber M, Pope G. Medicare risk adjustment for the frail elderly. Health Care Financ Rev 2008;30:83–93. 14. Blankertz L. The value and practicality of deliberate sampling for heterogeneity. Am J Eval 1998;19:307–324. 15. Bernard HR. Research Methods in Anthropology: Qualitative and Quantitative Approaches, 4th Ed. Lanham, MD: Alta Mira Press, 2006. 16. Maxwell J. Qualitative Research Design: An Interactive Approach. Thousand Oaks, CA: Sage, 1996. 17. Ryan GW, Bernard HR. Techniques to identify themes. Field Methods 2003;15:85–109. 18. Cohen J. Weighted kappa: Nominal scale agreement with provision for scaled disagreement or partial credit. Psychol Bull 1968;70: 213–220. 19. Segelman M, Szydlowski J, Kinosian B et al. 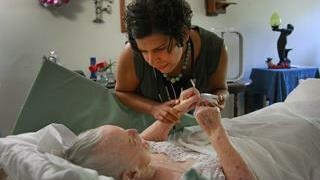 Hospitalizations in the program of all-inclusive care for the elderly. J Am Geriatr Soc 2014;62:320– 324. 20. Joynt KE, Gawande AA, Orav E et al. Contribution of preventable acute care spending to total spending for high-cost Medicare patients. JAMA 2013;309:2572–2578. 21. Hansen LO, Young RS, Hinami K et al. Interventions to reduce 30-day rehospitalization: A systematic review. Ann Intern Med 2011;155:520– 528. 22. Hughes SL, Weaver FM, Giobbie-Hurder A et al. for the Department of Veterans Affairs Cooperative Study Group on Home-Based Primary Care. Effectiveness of team-managed home-based primary care. A randomized multicenter trial. JAMA 2000;284:2877–2885. 23. Chang C, Jackson SS, Bullman TA et al. Impact of a home-based primary care program in an urban Veterans Affairs medical center. J Am Med Dir Assoc 2009;10:133–137. 24. Centers for Medicare and Medicaid Services. Independence at Home Demonstration [on-line]. Available at http://innovation.cms.gov/initiatives/ independence-at-home/ Accessed August 16, 2013. 25. Sofaer S. Qualitative research methods. Int J Qual Health Care 2002;14:329–336. 26. Kinosian B, Edes T. Home based primary care for frail homebound veterans as a model for Independence at Home. J Am Geriatr Soc 2010;58: S116.